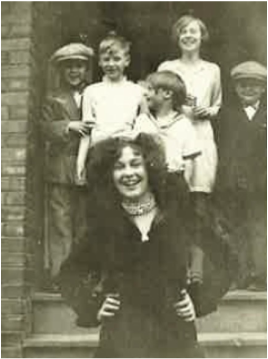 Margaret was Benjamin and Olive's first child, born September 3rd, 1911 in Toronto. Little is known by the family about Margaret. She married Harry Moule February 9th, 1931. She died suddenly just one month later, on March 12th, 1931. Margaret died tragically, from septicemia, the cause is unknown. She was just 19 years of age. One thing that we have noticed from the two photos we have was that she had an infectious smile and seemed to have a love of life. The fur neck piece she is wearing was most likely made from mink or fox and was most likely fashioned by her father, Benjamin, a furrier by trade. These were very popular at the time. In the second photo taken in 1929 she is again modelling a fur collared coat while five young children seem to be her fans.